Surprise! Nickels are actually made mostly of copper. The metal composition of a nickel is 75% copper and 25% nickel. So a nickel is made of some nickel, but mostly, a nickel is made of copper. Say, “Goodbye!” to the Copper Nickel. And, “Hello!” to the Steel Nickel. The largest nickel investment problem in United States history is about to happen. Nickel Investors beware! You are about to jump the most important hurdle of the entire nickel investing process. And you can never go back. On December 15th, 2011 new legislation proposals have called for the elimination of the copper nickel in favor of the cheaper metals by changing to steel nickels. Though the bill was introduced with regional incentive to Ohio, with its historically developed steel industry, the lasting results and effects of the bill will still be felt nationwide. Will this bill pass? No one will know until it is voted on. But the point is that the bill existed, the public will become aware of the growing cost to make a nickel, and therefore, support the change. Politicians like being re-elected, so they do what makes their voters want to continue to vote for them. Therefore, there is a great possibility that the nickel metal composition change will occur. The 2012 nickel composition is still zinc, but if this bill passes, the 2012 nickel composition may become steel. What does a metal composition of the nickel mean to nickel prices? Right now, if you want copper nickels, you can drive around to banks and pick up nickels from branches. All nickels you get will be copper (unless you find silver war nickels). You can order from us to save huge amounts of time and we can mail nickels directly to you or any place of your choosing. We can even help you arrange to store hundreds of thousands of dollars in secured facilities if you wish to make bulk large nickel investments. Once the nickel metal composition changes, nickel prices will jump because sorting will become required. Steel nickels are not as valuable as copper nickels. You will need us to process all nickels to sort the copper nickels out of the steel nickels. This adds two brand new dilemmas to nickel investing: Time and money. Time because it requires vast amounts of time to sort coin. It is quite a process to sort through literally tons of coin. Money because not only does time equal money, but there is cost to sort, and redeposit those steel nickels back to the bank. Basically, nickel investing goes from incredibly cheap, to having higher cost, making your initial capital investment in nickels greater. Buy nickels today before a metal composition change occurs. When a coin is made, there are three main stages to its development and practicality: Production, distribution, and use. Respectively, these could also be called: Cost, Value, and functionality in society. The production of the coin is the cost to physically create the coin. Distribution is the cost to transport the coin to users and the price the producer (in this case the United States Mint) can sell the coin for. Use is simply the willingness of the coin buyers to have a use for the coin, whether selling numismatically for coin collecting or in trade as a currency. The sale price in the distribution stage, with copper nickels, is lower than the production cost. Meaning that even with charging a premium above face value, the United States Mint does not have enough demand for the new copper nickels to offset the manufacturing cost to make the copper nickels. Therefore, a copper nickel is a bad business decision. This bill is an attempt to make the sale of the nickel a good business solution, which assumes the latter stage (use of the coin in society) is still practical. Nickel investing is at an important crossroad. The copper nickel is worth more than its face value. However, with copper prices lower, this fact is hidden by the state of the economy by manipulated metal prices, including copper pricing. As time progresses, copper price will correct itself and the copper nickel value will correct with it, rising in metal value. Right now, you can buy copper nickels dirt cheap. Copper nickel investing even has a floor insurance back up plan: Each nickel is worth five cents, so in a worst-case scenario, you can cash in on your currency value of the nickel investment to have an investment exit strategy. If the nickel metal composition changes to steel nickels, you won’t be able to simply buy copper nickels without the process of sorting equipment usage and access to large volumes of nickels. This creates a processing problem and a sourcing problem. The more work involved in an investment, the more cost. We have a solution: “Buy nickels today” before the term becomes “buy copper nickels today.” Once the term changes, the cost investment capital cost with the extra need to differentiate between copper nickels and steel nickels. Even if copper soars in the furture as i can remember close to $5 a pound how will people trade such as the penny or nickel? I think what your doing is a great idea we need everyone to start putting some copper away as an investment to creat a (supply and demand). What i noticed about copper is that the price can go up in a bad or good economy where gold and silver goes up only during inflation when people feel there dollar becomeing weak. Im sure u know this already just wanted to share. I am curious on the bullion coin even if we cant send them to the melting pot im sure there will be a way to trade at a premium. Share anything if u can. Thank you for the great question about how to trade copper pennies or copper nickels without melting. The key is recognition. If you purchased a copper bar or copper ore, the purity may vary based on the maker of the bar/ore. Even if the copper bar is stamped, the purity will have to be whether the buyer trusts the integrity of the company that stamped the bar to be accurate. The copper penny is made by the United States mint, which is required to print their coin in the composition mixtures specified by laws. These laws mean that if you see a copper penny, you know 100% that it is made of 95% copper and 5% zinc. If you see a Lincoln Wheat Cent copper penny, you know 100% that it is made of 95% copper, 5% zinc, with a very marginal portion of the zinc being potentially tin. This recognition means that anyone that looks at the coin knows the product or can easily look up the coin via many different sources to verify copper content. The above statement can be verified by looking at how U.S. 90% silver coins are traded. These coins could be melted down. But keeping them in coin-form means the silver is easily recognized as being guaranteed to have 90% silver content. This mentality also works for gold coins in how recognition assures the buyer of the purity of the metal. You touched on copper price during good and bad economies. I agree with the majority of what you said though I’d add that copper does increase in value from inflation as well. We touch on this concept in our Investing category on copper pennies and nickels investing. Feel welcome to browse at your leisure and comment on anything you’d like to contribute in return. What are the years that the nickel changed in composition. ie 95%copper 5%Nickel ? When is the proposed change to steel to go into place (Month)? And lstly wont there always be a place for sorters since nickel actually markets higher than copper? The copper nickel has been being made of 75% copper and 25% nickel since 1946, known as the Jefferson nickel. 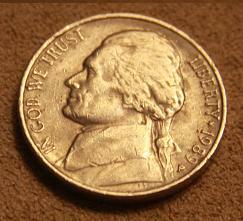 Between 1942-1945, the nickel was made of 35% silver, 56% copper, and 9% manganese. This was due to a copper shortage in WWII. Before that, the different types of nickels, including the Buffalo Nickel, was made of 75% copper and 25% nickel. So really, the majority of the nickel’s existance it was made of 75% copper. There hasn’t been word yet on the exact details on legislation language that I’ve found (just rumors, not concrete yet). There’s definitely a committee formed though to propose changes by December 2012 if this proposal doesn’t go through. So either way, a metal composition is highly anticipated to be hammered out sometime this year. The only question is when. Our thoughts are simple: better prepare now for the change than wait until the announcement comes out! We like to be ahead of the game. Your last question is a great one! Technically, there always is a place for sorters. The nickel is only 25% nickel, so even though nickel does market higher, you’re losing 3/4s of any price spike in nickel. So what is the goal of the sorter? Hand sorting for buffalo nickels, V nickels, and silver nickels is one thing. But trying to invest in specifically copper nickels for the copper and nickel is the key. Right now, you can get a bag of nickels and be 100% sure it’s going to be copper nickels (aside from random rare coins like silver nickels or other random coins in there). When a composition change occurs, to invest in copper nickels on a large scale, one will have to machine sort. This takes time, and also requires that the sorter deposits the bad steel nickels (causing both time and cost). The results: More time and more cost equals higher cost to obtain the copper nickels. So whether looking for the copper or the nickel in a nickel, it will cost more when steel rolls around to physically obtain those nickels. We’ll be stuck with steel nickels (or no nickels if they discontinue the nickel!). And that’s not going to be fun for any of us. Hope that helps answer your questions and thanks again for the great questions!